Food Costs > How Much Does Tilapia Cost? How Much Does Tilapia Cost? Tilapia, a species of the cichlid fish, comes from the tilapiine cichlid tribe and can be found in a variety of freshwater areas such as streams and lakes. Tilapia is known as an invasive species for some bodies of water, often taking over and killing off other species in the area. Because of its very low levels of mercury and low costs, tilapia is a popular fish, especially for those on a vegetarian diet. Even though they are native to the Middle East and Africa, they have been distributed across the globe, being farmed in more than 80 farms across the world. The cost of tilapia will depend on the time of the season, how it’s processed and where you purchase it from. On average, fresh whole tilapia can cost anywhere from $3 to as much as $8 per pound. Imported tilapia almost always is often going to be cheaper than purchasing tilapia within the United States. Fish purchased directly from the United States in natural waters can cost as much as $8 to $10 per pound. Frozen filets, often found in the frozen food section of your local grocery store, can cost anywhere from $2 to $4 per pound. If purchasing fresh filets from a reputable fish market, then the costs can be in the $10 to $15 per pound range. When filleted, the average tilapia will yield 30 to 37 percent, depending on the size and final trim. Live tilapia, if you’re able to find it in your local area, can cost about $1 to $2 for a small three-inch fingerling to as much as $10 to $15 for one that’s full grown. Green Acre Aquaponics, for instance, sells tilapia in a natural and sustainable aquaponic ecosystem, allowing them to live in an antibiotic-free and stress-free environment. Most fish sold here will come in 1.5 to three-pound quantities and will be served whole on ice. At the time of this writing, a whole non-fillet fish will cost $3 per pound, while a properly filleted fish will cost $12 per pound. Fisherman’s Cove, an online seafood retailer sells it for $5 per pound. According to this WashingtonPost.com article, fresh fillets can sell for $5 to $6 per pound, while a frozen fillet can be as cheap as $2 per pound. Frozen varieties will often be imported from Asia and will be the cheapest way to purchase it. Seafoodwatch.org recommends watching your intake due to poor farming conditions in most parts of the foreign world. 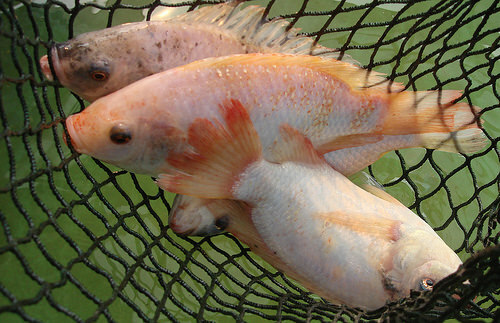 Fresh tilapia will come from the United States, Canada and parts of South America. Buying fresh will mean you can avoid environmental damage. Lastly, live tilapia will come from U.S. farms and allows you to inspect the fish before purchasing; however, buying live can often be hard, depending on where you live. Tilapia, according to most, won’t have a “fishy” taste and will be very mild in comparison, usually tasting like the sauce you cook it in. 100 grams of cooked tilapia will have 128 calories, 26 grams of protein and will be high in B vitamins, potassium, selenium and phosphorous. Be sure to know where your fish came from before purchasing as most of the tilipia on the market will come from another geographical location. Farm raised tilapia, for instance, does not offer as much nutrition value as a freshwater fish due to the corn that farm feed tilapia eats. In the United States, either ask the fish market where the fish originated from or check the packaging to see its country of origin. Be careful as some tilapia process has been linked to carbon monoxide. Consider purchasing frozen boxes as these tend to be cheaper than purchasing fresh tilapia. Wholesale clubs, for example, sell boxes of Tilapia for a low cost. While imported fish will usually be cheaper, many do not even notice the difference in taste. Research the name of the fish farm ahead of time to get a better idea of the quality.